With its tense action sequences and strong female characters, this romance will also satisfy fans of crime thrillers. Bouquets of flowers and boxes of chocolate have no place in Jayne Menard’s New Growth. This suspense- filled second installment in the Spook Hills Trilogy follows former FBI agent-turned-consultant Mathew Heylen as he tries to find someone with whom to share his life. Obstacles such as uncertainty and near-death experiences prevent the pursuit of happiness from going smoothly. Broken into two story lines that eventually converge, the novel details Mathew’s struggles to find love among the vines in Oregon wine country, as well as telling the story of Cruze Fuentes, a former drug dealer whose case Mathew worked on as an FBI agent. Mathew begins the narrative by tracking down the people that abducted the daughter of his love interest, Callie. Cruze, tucked away in hiding, discovers his brothers have been murdered and seeks revenge. When the paths of the two men cross, their lives become entangled and lead to further complications, which separate Mathew from achieving his goal of finding love. Filled with extensive character descriptions, the book is saved by its female characters. The women in this book are fully developed characters and their capabilities are well detailed. Callie, who begins the book trapped in a loveless marriage, takes control of her life and discovers herself as the novel progresses. The other women also prove integral to the men’s success in life, in love, and in the men’s work, as well. On the other hand, the male characters feel one dimensional. This discrepancy between the genders create a detachment from the story that is hard to follow and be engaged with, especially because the main character is male. Even though it is a romance, the book seems to be more interested in the technical aspects of the FBI and other couples’ relationships than in the actual relationship between Callie and Mathew. Details of other relationships are given to compare and contrast, at the expense of focusing on Callie and Mathew’s relationship and its progression. Menard’s prose is the most captivating aspect of the novel, though it does contain some errors in punctuation and grammar. 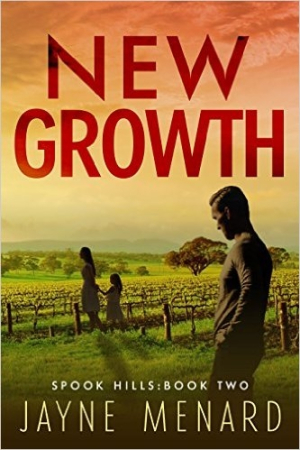 Though it is the second book in the trilogy, New Growth can be read as a stand-alone book. With its tense action sequences and strong female characters, this novel will satisfy the fans of crime thrillers, while still giving romance fans gratification.